strengthMuscle strength and power that takes place in Mountain biking, that is, helps you develop both brute force compared with other physical activities or sports. 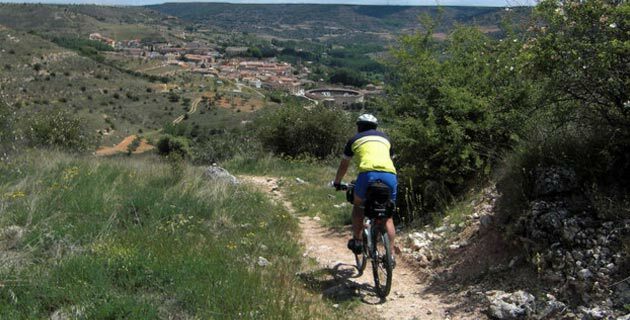 EnduranceCardiovascular endurance constantly providing Mountain biking practice, that is, how much help you cope ejercitándote long compared to other sports or physical activities. 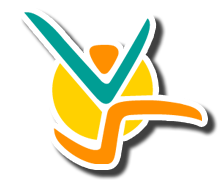 AgilityAbility to move the body as desired quickly and accurately obtained by practicing Mountain biking, constantly compared to other physical activities or sports. ReflexesAutomatic responsiveness to stimuli is achieved spontaneous Mountain biking, practice compared to other sport or physical activity. AccuracyHow much will dominate specific body movements to achieve the same result to practice Mountain biking, compared to other sports or physical activities. BalanceBoth are able to control the body's muscles to prevent the imbalance by making Mountain biking unlike other sports or physical activities. ConcentrationThe ability to focus mind and senses intention to achieve a specific goal that is acquired by practicing Mountain biking, compared to other sports or physical activities. ToningStylization of the body and muscle derarrollo pruduct of optimal levels of body fat that comes from Mountain biking, compared to other sports. 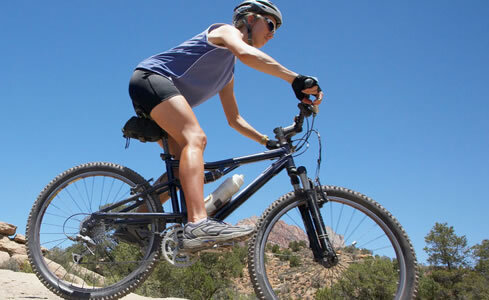 Calorie BurningThat many calories are burned while practicing Mountain biking, when compared to other sports or physical activities. In this activity a person riding a bicycle can travel long distances in difficult and dangerous terrain at unimaginable speeds. The practice provides great physical and mental benefits, since it requires exercise to strengthen the body, concentration and mind control to respond appropriately in critical situations, plus it can be good for the stress, because it is live entirely new and different experiences. 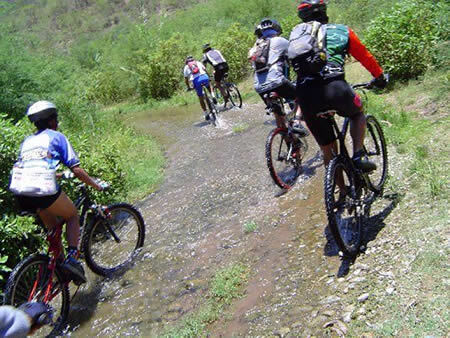 The Mountain Biking quickly spread and popularized. 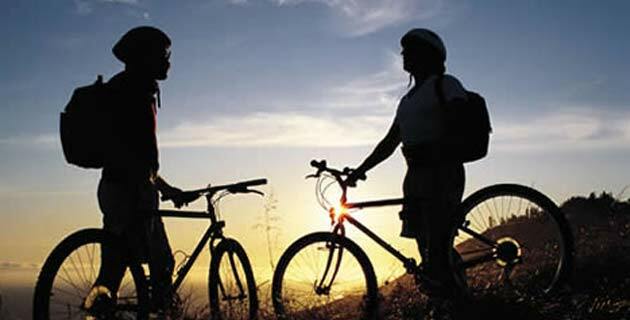 Many companies involved in adventure sports and knowledgeable people began to organize tours or mountain bike excursions. These activities were very successful and a large number of enthusiasts took part in these adventures. In the early 70's fashion began to use the bike on dirt roads. Began to surface several groups of cyclists who practiced this new modality including so-called "The Canyon Gang", represented by John York, Tom Slifka, Robert and Kim Kraft, who were dedicated to pursue careers in the "Tamalpais" mountains in the state of California, but the bikes that were used was cross bikes (with very thin rim) which was very commonly found in Europe at that time. It was then that Joe Breeze, Charlie Kelly, Gary Fisher and Tom Ritchey came up with wide tires putting on to their old Schwinn Excelsior bike brand weighing about 18 kg and thus received more control and were the fastest of the mountain. o	Remember the most important thing is to have self-confidence and on the bike, know how it behaves and operates the suspension. By starting this activity, you must first overcome obstacles such as small rocks, roots, ditches, etc., and then gradually increase the speed while maintaining control of the bicycle. Remember that if you go to a very slow speed, the rocks and roots would not let you progress, while causing you some falls and despair at not overcome a rocky area, which is why you must keep the bike at a good speed in which the driver feels safe. Most of the time is used the rear brake, because if you stop in a very long downhill slope with the opposite brake, surely you’ll be flying off forward. Taking sharp turns may cause the bike to slide on the terrain and move uncontrollably, but if you use your waist correctly to keep your balance, you will be able to keep on track without difficulty. When the rider feels out of control, it should be released the rear brake a little so the tire will not be able to get stuck in the rocks. For very steep descents or climbing stairs roots or high rocks, change the center of gravity by throwing the body all the way back. Avoid getting too tense, this will let you free from falls, fatigue and cramps, it is preferable to release the body to absorb better the impacts. Always keep your eyes ahead to know where to turn or move. If you are unsure to be able to go through some part of the road is better get off the bike, in this way you avoid getting hurt or break a bone. Remember, the best way to do a good descent is practice and practice until you achieve the necessary security required by the downs. 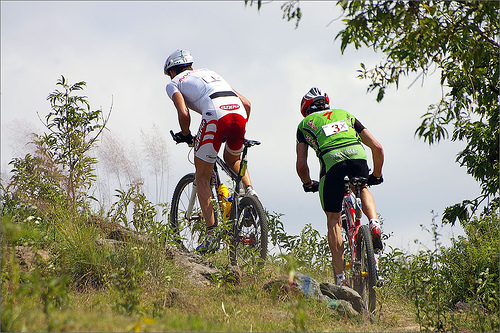 Race in which four cyclists compete simultaneously on a downhill circuit with obstacles and spectacular jumps. The first to reach the finish line wins. Competition is in roads totally down with jumps and natural and artificial obstacles. The bicycles are heavier than the currents due to the requirements of the road. In this mode it competes with clocked times, wins who made ​​the descent in the shortest time possible. Most widespread mode, usually performed in natural circuits with narrow roads, steep climbs and fast descents, minimal 6km long and up to 2 hours 30 min travel times. XC bikes are made of aluminum, titanium or carbon, as light as possible. The Cross Country is part of Olympic sports since 1996.